With an enthusiasm that could drain a Chicago power grid, Clark Griswold (Chevy Chase) follows the Holiday Road back to his own home in Chicago, Illinois for a family holiday staycation, where Clark shows us that his commitment to making sure his family has an amazing time is not just limited to road trips: “Ellen, I want to have Christmas here in our house. It means a lot to me. All my life I’ve wanted to have a big family Christmas,” and in Christmas Vacation ‘a big family Christmas’ Clark gets – complete with all the nutty-fruitcake-characters his extended family (not all of whom are invited) have to offer. 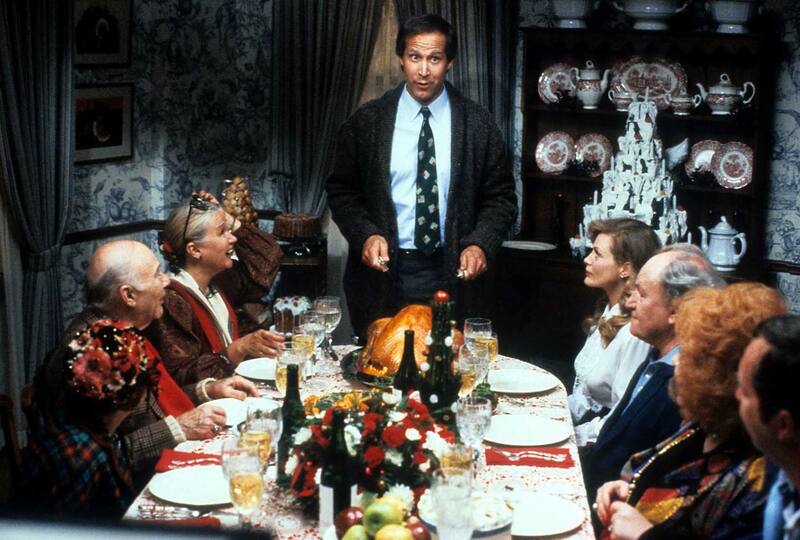 In this the third, and the most financially successful of National Lampoon’s Vacation series, Clark Griswold nudges, nags and pleads his familial guests into sharing his passion for the season, but is forewarned by his lovely, patient, and supportive wife Ellen (Beverly D’Angelo) that he “sets standards that no family event could live up to,” and his son Rusty (Johnny Galecki) and daughter Audrey (Juliette Lewis) seem resigned to the fact that their overly enthusiastic dad will fail spectacularly – from picking out the family Christmas tree, to hanging over 25,000 imported Italian lights on the house that won’t turn on, they’ve seen this kind of thing their whole lives and it’s getting embarrassing. Unfazed, Clark forges ahead, welcoming Ellen’s parents – Art and Francis (E.G. Marshall, Doris Roberts) who are wonderfully off-put and not shy about pointing out Clark’s failings, “Clark, the little lights aren’t twinkling,” “Thank you for noticing, Art” and his own parents – Clark, Sr. and Nora Griswold (John Randolph, Diane Ladd) who are proud and supportive of their son – the polar opposite of his in-laws, and it’s easy to see where Clark gets his love of family. Rounding out the invited guests who bring more grief to Clark’s home are, Aunt Bethany (Mae Questel) with her overly painted face and patriotic dementia, and her impatient husband Uncle Lewis (William Hickey) who wears a loose toupee and smokes cigars dangerously close to the Christmas tree. Despite these less than ideal house guests, Clark is up for the challenge. He’s not quite in over his head. That is, until his dickey wearing, beer swigging Cousin Eddie (Randy Quaid) arrives in his old RV, with his wife Catherine (Miriam Flynn) and their two children (their third is in re-hab) to crash the Griswold’s Christmas, camp at the curb and repulse the uptight yuppie neighbors (Julia Louis-Dryfus, Nicholas Guest). Quaid is sublime as the down on his luck, out of work Cousin (“he’s holding out for a management position”) with a heart that’s bigger than his brain, and a love for Clark that’s as big as his own lack of self-awareness. Despite appearing in such films as: The Last Picture Show, The Missouri Breaks, The Last Detail, Midnight Express, Independence Day, and King Pin – Quaid has said of his Cousin Eddie character, “I get a lot of recognition from that role – probably as much, if not more, than any other.” It doesn’t take long for things to break bad for Clark. The mishaps, disappointments and damage to his home become so great, he takes a turn from Clark Griswold to Dark Griswold, as his hopes for a Norman Rockwell like Christmas go up in a ball of burning feline smoke. It truly becomes a Tylenol inducing, four alarm emergency of a family Christmas, that Cousin Eddie tries to rescue by kidnapping Clark’s cheapskate boss (Brian Doyle-Murray), who is wonderfully cantankerous as a bah-humbug foil. A common thread that’s woven into Hollywood’s black and white Christmas classics such as A Christmas Carol, A Miracle on 34th Street and It’s a Wonderful Life are people who are burdened by financial chains. Christmas Vacation finds footing in that formula while sledding its own trail. In A Christmas Carol, Ebenezer Scrooge has mortgaged his empathy towards his fellow man in the pursuit of financial security, and experiences an epiphany when he sees how happy Bob Cratchit’s family is with so little. A Miracle on 34th Street has R. H. Macy’s (Harry Antrim) concern about profits supersede Doris’ (Maureen O’Hara) objections that Kris Kringle (Edmund Gwenn) might be delusional and unfit to play the role of Macy’s Santa Clause. It’s a Wonderful Life has the sympathetic George Bailey (James Stewart) driven to the brink of suicide when his sweet-natured Uncle Billy (Thomas Mitchell) loses the $8,000 savings and loan bank deposit. Christmas Vacation has Clark over extended, due to the $7,500 deposit he put down on a swimming pool, while he pensively waits for the company’s yearly Christmas bonus to appear in the mail. Certainly not the stakes George Bailey was facing in jail time, and the ruin of his family name, but for Clark, who puts such pressure on himself to make his family happy, it’s all relative in his (Wally) world. 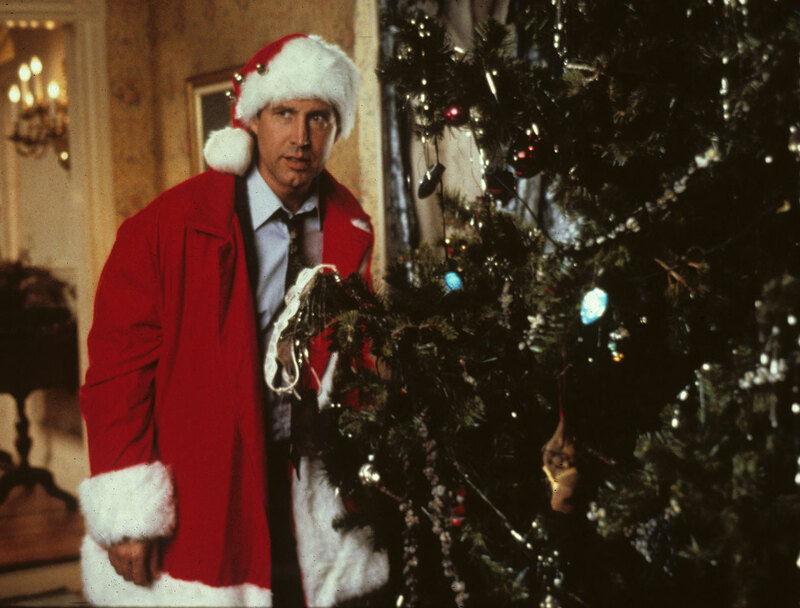 It is these two plot pillars that hold up Christmas Vacation and resonate with its audience so successfully: the financial stress of Christmas and spending time with family in a confined space. John Hughes was initially reluctant to pen the screenplay for Christmas Vacation when Warner Brothers “begged” him to write another Vacation film, but eventually acquiesced, because he “had a good story to base it on” – Christmas ’59 – his short story that was published in National Lampoon (magazine) in December of 1980. Hughes’ screenwriting talent is unmistakable, as he designs a gauntlet of obstacles that Clark must endure and navigate, building each scene off its predecessor, and director Jeremiah Chechik does a brilliant job of putting Clark’s family members in the way – ratcheting up Clark’s stress as Christmas innkeeper. John Hughes seemed to have a creative soft spot for the holidays and Christmas films, writing the screenplays for, or directing: Planes Trains and Automobiles, Christmas Vacation, Home Alone and The Miracle on 34th Street remake. Incidentally, while writing this blog, The Breakfast Club was chosen by the National Film Registry for preservation. Chevy Chase’s physical comedy is never better, from laying in bed with magazine subscription cards stuck to his sap filled fingers, to hanging from the roof a la Harold Lloyd clinging to the hands of the skyscraper clock in Safety Last! or turning into a tongue tied wreck over the gorgeous sales woman at the lingerie counter “I was just blousing—browsing.” Screenwriter John Hughes and first time director Jeremiah Chechik capture all the comedic gifts their cast has to offer, propelling the film to the summit of “Christmas Classic” status. How does a film become a Christmas classic? From a purely emotional point of view, the holiday season wouldn’t feel complete without watching it, and we want to share the film with people we care about. From a critical view point, the film must rise above the genre, or in exceptional cases, embody it. 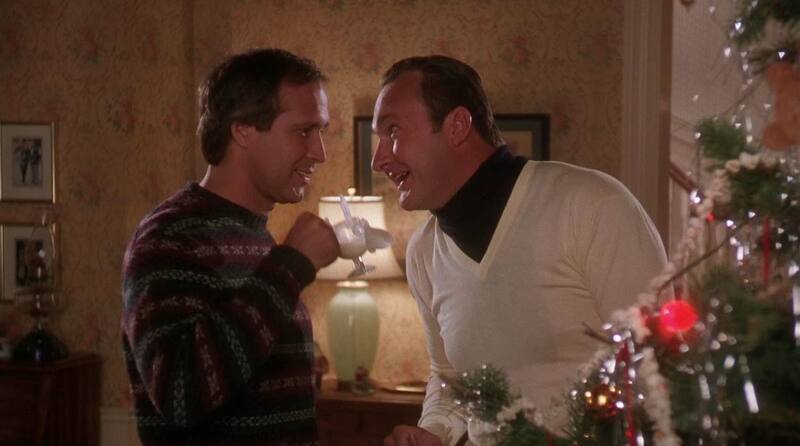 In the long run, the genre can’t be discussed without including the film and it must be quotable – “Shitter’s full!” The test of time has shown that Christmas Vacation hits these notes, so bundle up and catch it on 35mm, and have the “hap-hap-happiest Christmas since Bing Crosby…” well, you know the rest.